Black-eyed Susan flowers grow by a rustic post-and-rail fence which borders a field near my studio. These flowers return every year to the same spot and I enjoy their perky brightness as I walk by. The posts of the fence are made of tree trunks with the bark still on them giving a warm country feel to this painting. 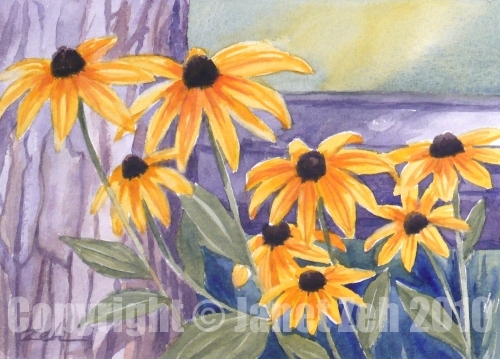 You can find my small original floral watercolor paintings for sale in my Etsy shop, JanetZeh.Etsy.com. Thanks for stopping by today!